I may be on the path of Krishna Consciousness , on the lower rung of the stairs, but definitely in food area I am very aware what I eat, or what goes in when I prepare a dish, or when/ what time I eat, I am food conscious, or ingredient conscious, or health conscious (oh I very much enjoy fast food, fried food, and all that should be avoided but regret having it later). What I am not is a gourmet cook/chef or a nutritionist/dietician etc. I became conscious of food when life put me on the path. Knowledge changes a person. So internet and quest for knowledge changed my views on food. Basically I rather cook from scratch than assemble store bought things or cook from a pouch. A pure simple home cooked food is best for a healthy disease free lifestyle. Google Mai, also taught me to adopt and adapt recipes to suit babies , eggless , party or diet for high blood pressure patient or any such needs that arise in a lifecycle.Whenever I visit a place I try to collect easy on the pocket, local and natural products for my home, mostly kitchen pantry ingredients. Google Mai helps me to study before hand of course :) Even when I go to grocery shopping I take a lot of time to understand the food labels and to consider before including any new item in my kitchen pantry. My sister chides me "there she goes staring at the aisle". I am drifting away with my banter. Back to my article on Palm Jaggery. The term SUGAR is very confusing for a diabetic person. It is like "To be, or not to be, that is the question" by Shakespeare. As, if the diabetic opts for artificial sweeteners then it is likely to alter their gut composition and open up for more diseases. Palm jaggery is a better alternative as it has lower Glycemic Index than the table sugar and is made from simple process and has medicinal properties. Diabetes is more of a lifestyle management than taking medication. I enjoyed reading a detailed article on Swasti's blog on how to identify palm jaggery and different types of palm jaggery in coconut palm sugar and diabetes. Here is article from American Diabetes Association on coconut palm sugar. Shunmuga sundari says "Everyone knows the fact that regular refined white sugar is harmful for health. Still people are not able to drop sugar from their diet until they get diabetes. Instead of waiting for a day when you are asked to completely avoid sugar and prescribed daily dose of medicines, start replacing refined white sugar with healthy sugar alternatives early not only for you but for your whole family" in her article Top 5 Natural Sugar substitutes. There are many links on the benefits of palm jaggery floating on the net. I liked this the best. Palm Jaggery we are calling as karuppatti in Tamil is made from the extract of Palm Trees. The process of making jaggery from the plant sources, does not involve any chemical agents and hence all the natural mineral salts are retained without adding any preservatives of chemicals. Jaggery is known to have various medicinal properties and other health benefits. Palm Jaggery is reported to have more nutritional and medicinal value than cane sugar. It is a good source of Vitamin B complex and it also contains ascorbic acid. It is delicious and has mineral salts too. During pregnancy, elders traditionally give kashayams every night from 7 month onwards to ease up the pregnancy difficulties, widely practised in Tamilnadu. Being rich in iron, it prevents diseases like anemia and also contains essential nutrients like magnesium and potassium. Magnesium is vital for the proper functioning of the nervous systems and the potassium regulates the blood pressure and the heart functions.It purifies the blood, prevents rheumatism and bile disorders and is highly nutritious in value. Jaggery is also useful in combating problems like cough and stomach ailments like indigestion, acidity and constipation. Recent scientific research has reaffirmed the benefits of jaggery for the sensitive organs of the human body like the lungs. Consumption of jaggery is useful for those who are exposed to pollution on a regular basis like industrial workers. It has been lauded for its ability to help the human body to fight off the ill effects of pollution. Palm jaggery is a natural sweetener and Energy Food, it is very rich in minerals, predominantly iron with traces of other mineral salts. The benefits of palm jaggery include its ability to cleanse your body, act as a digestive agent, sweeten your food in a healthy manner, provide good amounts of minerals. Highly rich in calcium.People often prepare sweets with jaggery. Particularly for naivedyam, jaggery sweets are preferred to sugar sweets. Our elders, they may not have degrees, but they do know where the ingredients come from and how they are made. They avoid sugar in naivedyam. Jaggery, which is bought in block form, is more nutritious and healthy than regular sugar because it is unrefined, contains no preservatives or synthetic additives, and has minerals such as magnesium, potassium and iron. Jaggery contains slightly less calories than table sugar, has a higher glycemic index and is sweeter than table sugar. Mahatma Gandhi recommended jaggery as part of his vegetarian, goats milk diet. He believed that consuming jaggery instead of sugar resulted in a slower rise in blood sugar.It is highly priced due to its medicinal properties and it makes it a unique product that can be used by people of all ages. Due to its cooling effects over human body, it is of high value. It does not have the bone meal content which is used for whitening processed sugar. 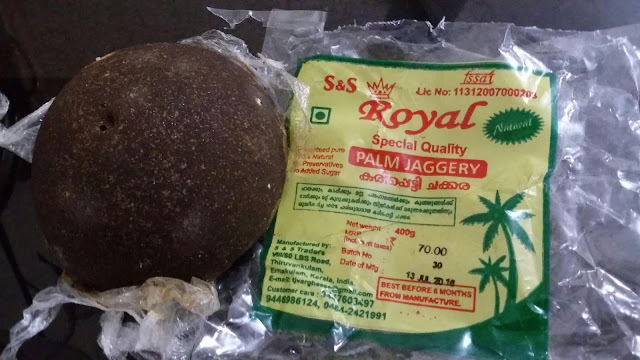 Palm jaggery is quite popular in the Southern states of Tamil Nadu (called Karupattivellam or panavellam), Palm Jaggery is rich in calcium, iron and other useful vitamins and minerals. Most of the time it is given to women who give birth to a child. If the palm jaggery are given to such women, then impurities in the breast milk would disappear and baby gets the white and clean milk during breast feeding. Even in the case of milking cows, the same thing is repeated after it gives birth to a calf. Jaggery is a healthy alternative to white sugar and is commonly known as 'medicinal sugar', because of its various health benefits. Jaggery acts as a cleansing agent for our body and effectively cleans the respiratory tracts, food pipe, lungs, stomach and intestines. It helps the body to get rid of the unwanted particles and thus provides relief from constipation. Jaggery proves as a great digestive aid and speeds up the process of digestion. Eating a few grams of jaggery after a heavy meal is often recommended for those having problems with normal digestion. In the body, jaggery activates the various digestive enzymes and itself gets converted to acetic acid, thus speeding up digestion. Jaggery is a rich source of many vital minerals that are required by the body for normal growth and functioning. It is considered as a store house of various important minerals like iron, magnesium, phosphorus, potassium, etc. Jaggery is used since ancient times to treat problems such as dry cough, common cold and asthma.It is beneficial in treating conditions like indigestion and constipation.Jaggery helps in promoting relaxation of muscles, nerves and blood vessels, thus enhancing their functions. Migraines, the most painful and uncomfortable type of headaches can be relieved to a large extent by jaggery. Jaggery is a rich source of iron and is therefore, very good for anemic people, as it increases the haemoglobin level in the blood. Jaggery has strong antioxidant properties and protects our body cells from the damage caused by free radicals. Jaggery has the ability to purify blood and helps in regulating the liver function. A mixture of jaggery and dry ginger powder taken with warm water can stop hiccups. Jaggery helps in regulating blood pressure and also helps the body to get rid of all the toxins. Jaggery is loaded with many essential nutrients such as proteins, vitamins and minerals, that play a key role in many life processes. Jaggery has potassium content that may help in reducing bloating and water retention. Jaggery used as an Ayurvedic medicine comes from palms. A quick fix medicine for common cold, cough etc, it dissolves mucus and clears the throat. Our products are manufactured under controlled conditions to ensure high quality while at the same time retaining the nutrient value, freshness and flavour. I am sure after looking at the following videos your sugar consciousness will increase :) and is a eye opener to protect your general health from sugar. It is important to limit sugar/salt intake if a person is obese or need to watch your weight. Please leave your comments.